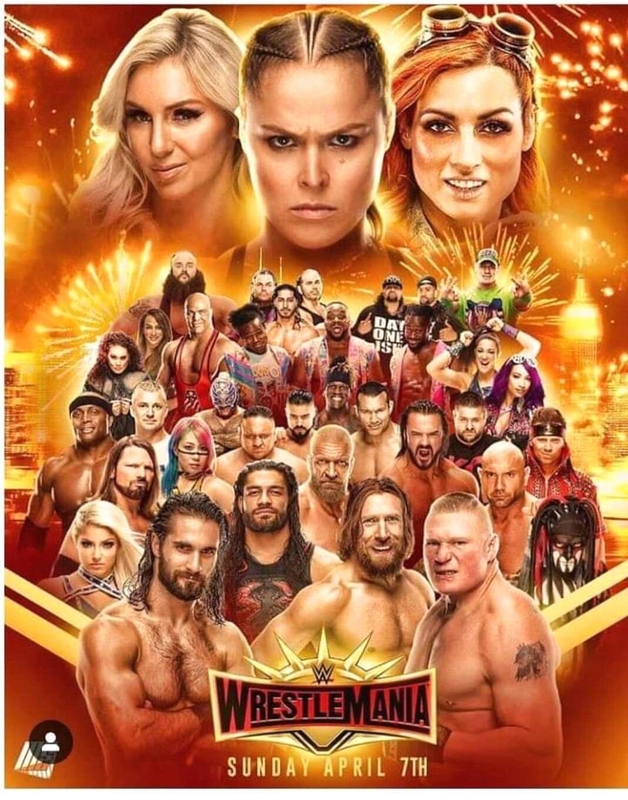 The 35th annual WrestleMania pay-per-view took place tonight at MetLife Stadium, and in a shocking turn of events, The Universal Championship match opened the show. WWE Universal Champion Brock Lesnar wasted no time in attacking his challenger Seth Rollins before the bell rang. Rollins took a knee to the gut as he was entering the ring and ended up getting hit with an F5 on the outside of the ring. The Architect was then tossed around over the announcers tables before Lesnar finally brought him into the ring for the match to officially start. Rollins was the victim of multiple German suplexes from Lesnar, and when The Beast looked like he was about to finish Rollins with another F5, Rollins countered by pushing Lesnar into the referee. As the ref's back was turned, Rollins hit Lesnar below the belt and three curb stomps later, we had a new WWE Universal Champion. I expected Rollins to win, but I was surprised by how quick this match ended. A.J. Styles vs. Randy Orton is up next in what was one of the best builds to a match on the card. The match started with Orton and Styles trading headlocks before The Viper hit a picture perfect dropkick to take control. After a back and forth battle that saw Orton hit Styles with a powerslam and Styles hit a couple of springboard forearms, Styles was able to lock in the calf crusher, but Orton escaped. Orton hit Styles with an RKO later in the match, but to Orton's surprise, Styles kicked out. The action went to the outside, and as Styles was making his way back into the ring, Orton went for another RKO, but it was blocked by Styles and he hit a third Phenomenal Forearm for the win. The Usos defended their SmackDown Tag Team Championships vs. Cesaro and Sheamus, Rusev and Shinsuke Nakamura and Aleister Black and Ricochet in a fatal four way. The action was fast and furious as blindsided tags were made and no team could gain an advantage for more than a few minutes. Ricochet countered Cesaro's tilt a whirl slam attempt into a head scissors, but ate an uppercut right after he displayed his elusiveness. Cesaro then spun Ricochet around for about 30 rotations and put him in a sharpshooter. The other combatants got involved and as it looked like a car wreck was about to happen with The Usos getting ready to superplex Ricochet and Rusev and Nakamura attempting to power bomb The Usos, Ricochet miraculously landed on his feet. Sheamus made blind tag and almost everyone took a knee strike or superkick to the head as all of the teams rushed the ring. Sheamus ended up taking two superkicks from The Usos and a double splash for the champs to retain. Shane McMahon vs. The Miz in a falls count anywhere match started with Shane taunting Miz in a game of cat and mouse. The self proclaimed best in the world went to the outside and ended up grabbing the face of Miz's dad whom was sitting ringside. This infuriated Miz, but it was the perfect trap for Shane to take over as Miz ran to the outside and chased him back into the ring. Shane rained down punches on Miz and eventually took things outside the ring to set Miz up on a table. Miz's dad stepped in to stop Shane from landing an elbow from the top rope and got beatdown for his troubles. This lit a fire in Miz as he attacked Shane with a vengeance that started with punches and a dive into the crowd that sent Shane retreating for cover. Miz would not let up as he attacked Shane with steel chair shots and put him through a table. Miz would eventually knock Shane on top of a golf cart which he bounced off the top and fell to the floor. Miz looked to finish Shane off with a superplex from the top of a structure, but Shane landed on top of the Miz after the superplex to pick up the win. Sasha Banks and Bayley defended their Women's Tag Team Championships vs. The Iconics, Nia Jax and Tamina and Beth Phoenix and Natalya. The Iconics showed some good team work with a double wheel barrel suplex to Banks. After getting worked over earlier in the match, Banks was able to counter a Glam Slam attempt by Phoenix into a Bank Statement, but The Hall of Famer would not tap out. Jax and Tamina laid waste to the competition without ever tagging into the match, but their flurry was short lived as their attempt for a double splash was stopped by Natalya and Phoenix. After Phoenix hit Bayley with a Glam Slam from the top rope, Billy Kay of The Iconins made a blindside tag and Peyton Royce threw Phoenix out of the ring for Kay to get the pin and win the titles. WWE's version of Captain Planet aka Daniel Bryan vs. Kofi Kingston for The WWE Championship was next. Bryan took control of the match by focusing his attack on Kingston's midsection. Bryan's challenger tried to feed off the emotions from the fans, but Kingston took a high risk and crash and burned when he hit the table on a dive to the outside. It looked like Kingston's dreams were going to go up in flames when Bryan eventually put him in the LeBelle Lock, but Kingston was able to fight and go to the ropes. Kingston gained momentum with a jumping double stomp to Bryan's chest, but it looked like Rowan was going to swing things into Bryan's favor at ringside, but Big E and Xavier Woods of The New Day were able to eliminate Rowan from the equation with a Midnight Hour on the floor. Kingston rolled Bryan back into the ring only to get hit with a Busaiku Knee, but Kingston kicked out which stunned Bryan. Kingston countered Bryan's stomps to the face with his own and eventually hit Trouble in Paradise to win The WWE Championship. Rey Mysterio vs. Samoa Joe for The United States Championship lasted about as long as their respective entrances. Mysterio started off quickly using his speed advantage to get Joe into position for a 619, but when it look like Rey was going to make short work of Joe, he was choked out by the submission machine who retained The U.S. Championship. Drew McIntyre vs. Roman Reigns in what quickly became a personal battle was next and McIntyre asserted his dominance with a belly to belly overhead throw. McIntyre was out to prove that Reigns lost a step and hit a suplex on the floor. The Scottish Psychopath awakened the Big Dog with a slap to the face which led to his downfall. Reigns hit a Superman punch and a spear for the win. Batista vs. Triple H with the latter's career on the line in a no holds barred match got violent in a hurry. Triple H beat Batista down with a steel chain to the back, used plyers to try and snap his fingers and ripped The Animal's nose ring out. Batista got back into the match by repeatedly slamming Triple H on the announcer's table. Batista then used the steel steps to his advantage and tried to put Triple H through the table with a powerbomb while standing on the stairs, but he was back body dropped onto the table. Triple H tried to use his signature sledgehammer to no avail as Batista countered with a spine buster. Triple H was able to kick out of a Batista Bomb and Batista kicked out of a Pedigree which led to a stalemate. Ric Flair eventually made his way to the ring because this whole feud started due to Batista's attack on him during his 70th birthday celebration. Flair handed Triple H a sledgehammer and Batista got distracted while yelling at Flair which led to Triple H connecting with a sledgehammer shot and a Pedigree for the pin. Kurt Angle vs. Baron Corbin in Angle's final match with WWE took place and Angle looked to prove Corbin wrong about him being unable to compete at a high level anymore. Angle hit Corbin with German suplexes and an Angle Slam in an early furry. As Kurt was going for the ankle lock, Corbin was able to counter and hit End of Days to win the match. Finn Balor vs. Bobby Lashley for The Intercontinental Championship took place after this and Lashley looked like one of the few wrestlers to not be intimidated by Balor's alter ego The Demon. Balor started the match with a dropkick to Lashley, a sling blade and another dropkick and looked to end things early, but Lashley was able to counter with a chokeslam. The action spilled to the outside when Lashley hit a spear through the ropes. Balor was able to get to his feet and hit another sling blade on The IC Champion, but got hit with a spear and was able to kick out which has not happened often if at all since Lashley started hitting opponents with a spear. Balor got back into the match with a powerbomb and a double stomp from the top rope to become a two time IC Champion. Charlotte Flair vs. Becky Lynch vs. Ronda Rousey for The Raw and SmackDown Women's Championships was the main event. Flair and Lynch formed a brief alliance as Rousey came out on fire attacking both women with punches and knee strikes, but was hit with a fall away slam by Flair. Flair and Lynch renewed the best rivalry on the main roster last year and tried to put each other away before Rousey could recover. Lynch was able to hit a DDT on Flair and a reverse DDT on Rousey to gain some momentum. Rousey once again tried to establish her dominance with a double arm bar on Flair and Lynch, but she took a dropkick from Lynch as she was draped over the top rope. Lynch eventually tried to bring a table into the no disqualification match, but Rousey was out to prove that she did not need a weapon and tossed the table after gaining the upper hand. Charlotte eventually went crashing through the table as she charged Lynch and Rousey, but they countered with a double hip toss. Rousey tried to end things with her Piper's Pit slam, but Lynch countered and rolled Ronda up on her shoulders to become the first ever Raw and SmackDown Women's Champion. It will be interesting to see the fallout on Monday Night Raw.